The tree develops a reddish-grey coloured and rather slender, bottle shaped trunk with a wide cantilevered crown. The trunk, also known as the bole, has the capacity to store enormous amounts of water. In its natural habitat carries foliage from October until May, and produces between May and August its white flowers that open up in the evening and exhale a watermelony scent. Origin and Habitat: Adansonia grandidieri is endemic to south-western Madagascar, from just north of Morondava to just north of Morombe. This species occurs in three districts of Menabe Region (Mahabo, Manja and Morondava). The population size is different in the five known subpopulations, being lower in the northern part of this region. Adansonia grandidieri is represented by more than an estimated one million individuals. Altitude range: Up to 50 metres above sea level. Description: Adansonia grandidieri is a deciduous, medium-sized, unarmed tree and may reach 30m in height. It is the most majestic and famous of Madagascar's six baobabs. 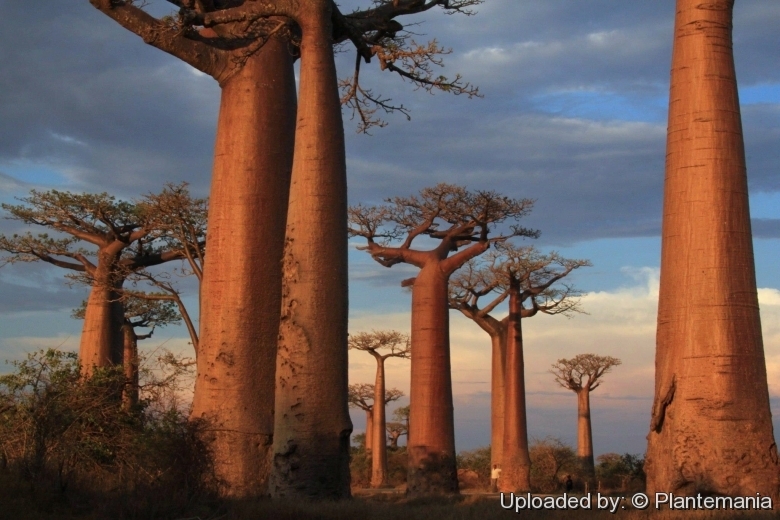 The best-known specimens form the Baobab Avenue near Morondava. Unique characteristics of Adansonia grandidieri are bluish green and densely stellate-pubescent leaves and a dark brown floral bud. Moreover the easily broken fruit is a character that distinguishes A. grandidieri from all the other species. This is the boabab mostly exploited for domestic use, with its fruit pulp eaten raw and containing loads of vitamin C, and the seeds used to extract cooking oil from. Derivation of specific name: This species was named after the French botanist Alfred Grandidier. Stem: The trunk or bole is massive, cylindrical, up to 3 m in diameter; outer bark smooth, reddish grey, inner bark thick, with tough fibres. The crown is flat-topped. The branches are regularly distributed, and mainly horizontal. Leaves: Arranged spirally, palmately compound, with (6—)9-11 leaflets; stipules up to 2 mm long, caducous; petiole 5-13 cm long, pubescent; petiolules 1-5 mm long; leaflets narrowly ellip-tical to lanceolate, medial ones 6-12 long 1.5-3 cm wide, margin entire, bluish green, densely hairy with short, clumped, yellowish hairs. It produces new leaves at the very beginning of the rainy sea-son and uses water stored in the trunk to sup-port new leaf growth. It is in leaf throughout the wet season from October to May. Flowers: Flowers are solitary and produced in leaf axils at the tips of leafless branches, they are bisexual, regular, 5-merous, large, showy and fragrant; flower bud erect, ovoid, dark brown; pedicel up to 1.5 cm long and 1 cm in diameter, dark brown hairy, jointed; calyx with tube c. 1 cm long, lobes 7.5-8.5 long, 1.5-2 cm wide, reflexed, and twisted, reddish brown hairy outside, creamy hairy inside; petals free, narrowly lanceolate to oblanceolate, 9-10 cm long, 1.7-2 cm wide, twisted, white, yellowing with age; stamens numerous, shortly fused at the base, up to 7.5 cm long, white; ovary superior, broadly rounded-conical, c. 1 cm long, lemon-yellow hairy, style longer than central stamens, white, persistent, stigma shortly lobed, white to pinkish. Fruit (berry): Large, oblong-ovoid to almost globose, with fragile, 2.5-4 mm thick wall, reddish brown hairy, many-seeded. Seeds: kidney-shaped, 12-14 mm long, 10-12 mm wide and 9-10 mm thick. Phenology: In Madagascar it flowers in May—August and fruit ripens at the end of the dry season in November—December. They open around dusk and anthesis takes only 15 minutes. 2) Ravaomanalina, H. & Razafimanahaka, J. 2016. Adansonia grandidieri. The IUCN Red List of Threatened Species 2016: e.T30388A64007143. http://dx.doi.org/10.2305/IUCN.UK.2016-2.RLTS.T30388A64007143.en. Downloaded on 15 December 2016. 6) Andriafidison, D., Andrianaivoarivelo, R.A., Jenkins, R.K.B., Ramilijaona, O., Razanahoera, M., MacKinnon, J. and Racey, P.A. 2006. “Nectarivory by endemic Malagasy fruit bats in the dry season.” Biotropica 38: 85-90. 7) Andrianaivo-Rafehivola, A.A., Ravaomanalina, B.H. and Razanameharizaka, J.H.N. 2013. “Toxicité de l’huile et des tourteaux de graines de baobab: cas d’ Adansonia grandidieri”. Académie Malgache. 8) Baum, D. 1995. “A systematic revision of Adansonia (Bombacaceae).” Annals of the Missouri Botanical Garden 82: 440-470. 9) Baum, D.A. 1996. 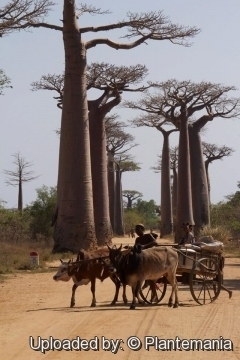 “The ecology and conservation of the Baobabs of Madagascar”. In: J.U. Ganzhorn and J.P. Sorg (eds), “Ecology and economy of a tropical Dry forest in Madagascar”, pp. 311-327. E. Goltze, Göttingen. 10) Baum, D.A., Small, R.L. and Wendel, J.F. 1998. “Biogeography and floral evolution of baobabs (Adansonia Bombacaceae) as inferred from multiple data sets”. Systematic Biology 47: 181–207. 11) Diop, G.A., Sakho, M., Dornier, M., Cisse, M. and Reynes, M. 2005. “Le baobab africain (Adansonia digitata L.): principales caractéristiques et utilisations.” Fruits 61(01): 55-69. 12) Rakotonindrainy, N.A. 2008. “Valorisation des fruits de deux espèces de baobab: Adansonia grandidieri et Adansonia za récoltés dans les régions de Boeny et Menabe”. Université d’Antananarivo. 13) Randjevasoa, B.N. 2003. “Etudes de quelques espèces menacées (Adansonia grandidieri Baill., A. rubrostipa Jumm. & Perrier; A. za Baill., Hazomalania voyronii Capuron) de la forêt classée de Kirindy Nord en vue de leur conservation”. Faculté des Sciences, Université d’Antananarivo. 14) Raveloson, C.O., Andriafidison, D., Razafimanahaka, J.H., Rabesihanaka, S. and Jenkins, R.K.B. 2014. “Les baobabs de Madagascar : quel cadre réglementaire pour leur conservation ? Madagascar” Conservation & Developpement 9(1): 31-35. 15) Razanameharizaka, J.H.N. 2009. “Régénération, démographie, physiologie de la graine et des plantules du genre Adansonia à Madagascar.” Faculté des Sciences, Université d’Antananarivo. 16) Sandratriniaina, A.N. 2015. “Anatomie et régénération d’écorce des baobabs citernes du plateau Mahafaly au Sud Ouest de Madagascar”. Faculté des Sciences, Université d’Antananarivo. 17) Vieilledent, G., Cornu, C. , Sanchez, A.C., Leong Pock-Tsy, J.-M., and Danthu, P. 2013. “Vulnerability of baobab species to climate change and effectiveness of the protected area network in Madagascar: Towards new conservation priorities”. Biological conservation 166: 11-22. 18) Wickens, G.E. and Lowe, P. 2008. “The Baobabs: Pachycauls of Africa Madagascar and Australia.” Springer Verlag, Berlin. Cultivation and Propagation: Adansonia grandidieri are quite easily grown from seed although they are seldom available in nurseries. Grow in good light, don't over-water and provide a minimum winter temperature of 13° C as they cannot tolerate frost. Despite its adaptations to dry climates, baobab will thrive in rainy climates provided it has a well drained soil provided they are frost free and don't experience cold winters. Saplings can be effectively grown in containers for many years before becoming too large and requiring to be planted into the ground. In this manner one can move them out of the cold into a warm position in a glasshouse or indoors behind a sunny window to prevent frost damage. It can be also trained as a bonsai tree. Fertilization: You can fertilize the plant every four to six weeks except during the dry season if it casts the leaves. Growing rate. Growth and development Taking into account its dry habitat, early growth of Adansonia grandidieri is fast; it can reach 2 m in height in 2 years and 12-15 m, with a bole diameter of 60 cm in 12 years. Watering: Baobab is very drought tolerant, and needs no water at all during the winter. Container grown plants should be water every four weeks, so that the roots don’t dry out completely. Hardiness: The Adansonia grandidieri hibernates in a bright place with a minimum temperature of 15° Celsius. Uses: The fruit of Adamsonia grandidieri are consumed locally and are considered to have the best taste among all baobab fruits, they are also used to make juice. The fruit pulp has high energetic value, and is rich in protein, calcium and phosphorou. The seeds are rich in lipids and are used by the population for cooking. Bark is used in traditional medicine. The bark fibres, locally called hafotse are used as ropes for fixing walls and roofs of houses and for making traditional Sakalava and Mikea boxes, baskets and mats. The species is also used on a larger scale for production of cosmetics; oil is extracted from seeds collected by Renala Naturals, which is a social enterprise that establishes sustainable supply chains in Madagascar. sand. It also can be started from cuttings.